I just imagine Tingle liking Metapod. They’re both green… etc… *cough* Every time I put Tingle in a comic, it ends up being a “Da-Da”. Which isn’t necessarily a bad thing, mind you. I guess I’ve never put the effort in to making a full-blown pun/twist comic for him because he’s just so weird, it would feel too structured, y’know? I mean, the STD comic and its follow-up, I only consider half Da-Da, but eh… Potato; Sandbag. Oh, hey! Premiere Pro was being a wretched PAIN to work with, randomly, but I finished and uploaded that timelapse! Update: My health suddenly took a dive and my organs are in an extreme amount of pain. I’ll be bed-ridden and hopped up on meds for a few days, but I’ll probably have the comic up Friday. This is wrong on so many levels. And who else but Tingle would stroke a Metapod?! 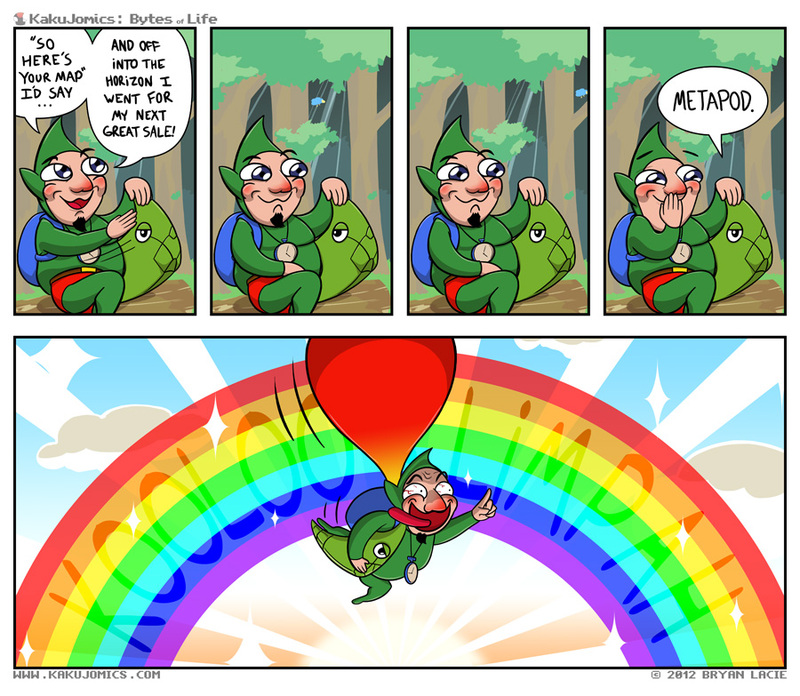 Tingle + Metapod = Greatest Pokemaster evar! Hell, yeah! Could you imagine Metapod with a balloon? COULD YOU IMAGINE THE POOWWAAHH!? Tingle’s less creepy and more “Malleo” now. that last panel should really be a wallpaper! I swear, tingle comics leave me trying to make his face for days. Sorry about your health kakujo. Thanks, oej! ^^ I’m feeling better, now, and am almost caught up. So more awesome, Nintendo referencing, funny, family friendly comics? YESSSS! Now we know who gave Kirby those bad directions.